← BUILDING…One Word, Express In One Hundred Words In One Hundred Days. STAGNATION…One Word, Express In One Hundred Words In One Hundred Days. 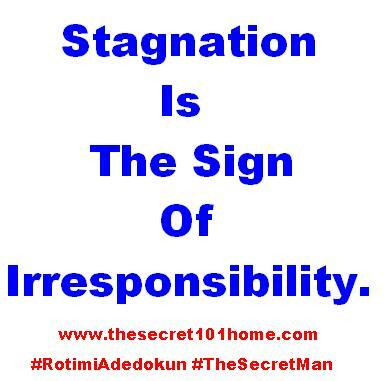 Stagnation Is The Sign Of Irresponsibility. If You Want To See Progress You Have To Be On The Move. If You Stand Doing Nothing You Will Get Nothing. A Life With Results Is A Product Of Action. To See Productivity, You Need To Get Involve In Activities. Laziness Is Not Just The Number One Factor To Become A Failure. It Is Also One Of The Requirements Into The University Of Poverty. You Provoke Result By Moving Things Around. Why? There Are No Baby-Sitters For Greatness. If You Want To Be There, You Have To Get There. It Is Called Responsibility. This entry was posted in Life and Time Management, Self Development, The Secret, Vitamin Of The Mind, You! and tagged Activities and Productivities, Bishop David Oyedepo, Jim Rohn On Activities, life and progress, Pastor E A Adeboye, Progress, Rotimi Adedokun on Productivity, The Secret Of Progress. Bookmark the permalink.